One of my greatest fears as a mother these days has been Carter falling out of his crib. It even wakes me up at night of the thought of my sweet boy falling to the floor. Well, today was the day! I woke up to the sound of "(THUMP!) AHHHHH FALLLLLLLLL!" Harley goes barreling through Carter's door and we find him on his knees on, (thank God!) his nice new thick rug we bought and put right beneath his crib. I think it scared the pants off the both of us more than any harm done. We sat on the floor of his room and held each other for about 10 min. I am not sure what he was thinking about, but I know all you mommies know exactly what was playing over and over in my mind. He is ok and back to his normal self with not even a scratch to show for it. We talked at length about how "we DO NOT climb in or out of our crib because it makes us fall and that makes mommy sad!" He can now tell you all about climbing out his crib and mommy being sad! Our sweet little boy is growing up! 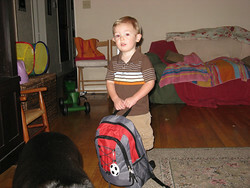 Yesterday was his first day of pre-school at Young Children's World at our church, Highland Church of Christ. It's only two days a week from 9AM to 2:30. He was so excited to see all of his little friends from church, he ran in and sat in his chair right away. As a mother, this gave me great joy to know that my baby boy knows comfort and can adapt so easily. It also made the tears subside as I left my little buddy of two years in the hands of someone else. I am sooo excited to see him learn and grow and make an impact in this great big world before him. 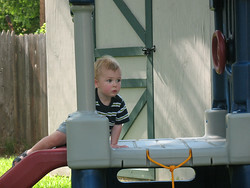 But most of all, I am very thankful he is growing up in the Lord. We are now at the 28 week mark and time is flying by. It really seems like yesterday was March 10th when we found out about our little blessing and what a blessing it has been. Since the first trimester yuckies, I have felt great. I must admit, I was fearful of a rough 9 months. However, my energy is sucked out of me daily by chasing Carter around the house! Other than a little fatigue, everything is great. I have gained 18 pounds so far and my doctor says that I am right on target, "big and healthy". I have been having some braxton-hicks contractions since our trip to Vegas, but he doesn't seem that concerned and contributes them to the extra activity I do with caring for the first child. Overall, we are soo excited for the baby (name yet to come) to get here and for Carter to meet his new baby brother. We had our 20 week sonogram today and are pleased to share a happy report. Everything was there and in the right place and the baby is healthy. Praise God! and…it's another BOY!!!! We are soo happy that Carter will have another little boy to enjoy his dump trucks, bicycles, and buses with! We also had another check up right after the sono and I am doing well also. We are truly so blessed and thank God everyday for this little miracle in our life! Happy Father's day to the best daddy in the whole world. I want to thank my wonderful husband for being so supportive, caring, and helpful with Carter. You truly are exactly what I envisioned a daddy to be. I love the fact that you are all about Carter and that Carter is all about his Daddy! Thank you for being the most important thing in mine and Carter's life. We love you so much. 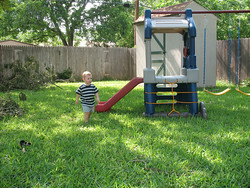 A new addition to the backyard.